And good riddance! This year has been a challenging one and I'll be glad to see it go. It seemed that every month brought a crisis or disappointment, and my husband and I found ourselves becoming less resilient. The most upsetting event will likely be an ongoing issue, but I am very grateful for a wonderful friend who supported me through the worst of the drama and beyond. There were smaller setbacks such as our refrigerator conking out one night in early December. It's true that I like the new one better, but the timing wasn't the best. Nor is it ever good timing for three root canals, which my husband had in November. I'm sure you're getting the picture of what our year was like--just one thing after another. I'm back. Shortly after the Duclay EGA retreat in Florida in July, I had rotator cuff surgery on my right shoulder. I honestly had no idea that the recovery would be so long and difficult (physical therapy is not for the faint of heart), but I finally have nearly my full range of motion and strength. 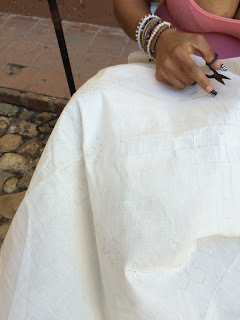 I couldn't stitch for about two months, and really missed picking up needle and thread. My large samplers are still in progress but I finished these two smaller pieces. 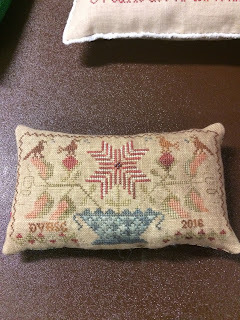 This pincushion from Blackbird Designs was the piece I stitched for the Delaware Valley Historic Sampler Guild exchange earlier this month. It's always fun to see what people make and great to be able to take home a reminder of someone in the guild.